Class L just got a whole lot tougher when Xavier moved down from Class LL. The Falcons return a good chunk of their lineup from last year's State Open, New England and NXN Regional championship team. They have a solid top three that should contend for the individual title with William Curran, Peter Schulten and Dillon Selfors. The one question mark is if All New England runner Robbie Cozean will race. According to his coach Chris Stonier "He's in great shape. He foot was causing him some discomfort but the MRI did not show a stress fracture. I'm going to use this week to assess his foot and then determine which race to have him run." Without Cozean, they might not defend their regional title, but they have so many other athletes who have stepped up and could help them win, including freshman Eamon Burke (no relation to Xavier great JT) who has settled into the #4 spot. Bristol Central finished a very respectable 3rd in the 28 team CCC. While they might not be at Xavier's level, they could take that 2nd spot in Class L. They had a 28 second 1-5 man split and a 17:11 average so that puts them in contention for the runner up spot. Pomperaug boys finally took home the SWC title after four years of taking the runner up spot. They were able to squeeze past perennial SWC power New Milford by four points. The two conference rivals will get their chance once again to battle it out once again for a spot at the State Open. Throw in much improved New Canaan and you have one competitive meet. According to the CIAC "The Open Meet will be made up of the top two teams from each division decided by points, plus eight additional teams decided by having the fastest team times." Many times, the eight fastest teams come from Class LL, but there should be at least one from Class L to advance to the next week. But that also means there will probably be a good team sitting home next Friday. 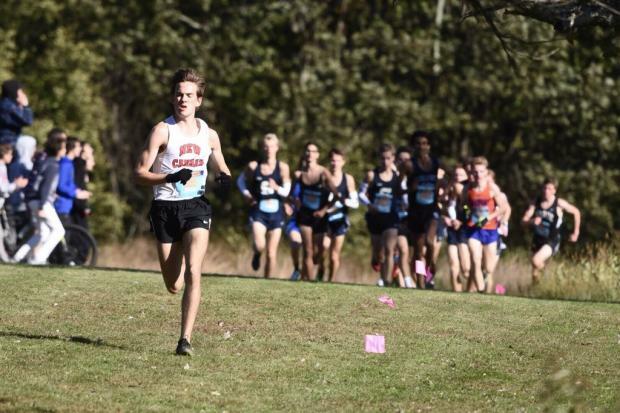 Individually, you have the New Milford's Eli Nahom, the SWC Champion vs Andrew Malling of New Canaan with Xavier's pack in the lead group. Nahom is the defending champion and he hasn't been seriously challenged all year, but he knows how to race. Then there is Manning, who was 16th in Class L last year over a minute behind Nahom. Throw in three runners from the Xavier who can work together and want to finish high not just for themselves, but their team and you have a very interesting race. Do you root for the favorite, who is looking to add to his already extensive resumes? Do you root for the underdog, who last year had no business thinking about being in the winner's circle and just put in a lot of mileage this summer so his dreams can become a reality? Or do you root for Xavier's magical year to repeat itself again and bring an individual gold medal on top of a team gold? There is certainly a lot of drama in this race and one thing is for certain- the good guy will win this race. The only question is, which one?